Chuzhou Jingjin Crafts Co., Ltd. - поставщик товаров в категории Стеклянная Свеча держатель стеклянная свеча банка стеклянный подсвечник стакан - Свеча банка. 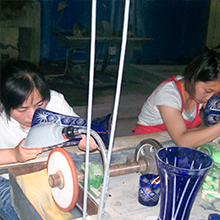 As a professional crafts company, we have been in this line for more than 15 years. 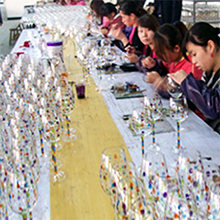 Our main products are as followings: 1) Glassware(Glass Tumbler, Stemware, Candle Holder and windlight) 2) Stone products(mainly slate and granite tableware and kitchenware) 3) Resin Crafts (mainly home deco animal hanging series) 4) Porcelain Items (vases, flower pot, jewelry series) Our strategic location, allows us to source raw materials and low cost labor force locally. 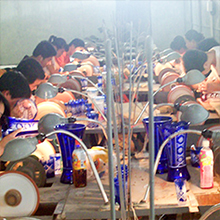 As a crafts expert, with strict quality control from our good QC team, creative ideas from R&D staffs and the hardworking of experienced workers, your orders are guaranteed to be of competitive price, good quality and prompt shipment. Through the combination of glass, slate, resin and porcelain, we want to show you the beauty of nature and life hidden in our products. In the past 15 years we have wined customer from all over the world due to our special motto: quality stable, delivery reliable ,price workable. We sincerely expected to have chances co cooperate with you to create a promising future!